On Wednesday evening I hosted the 2014 Epic Awards Winners’ Reception at Platform Arts in Glasgow. Delegates from the Voluntary Arts Scotland conference were joined by Epic Award winners and runners-up from across the UK and the Republic of Ireland. The evening started with a performance of a song from the Commonwealth Games Songbook from local voluntary arts choir, East End Voices. The awards and certificates were then presented by the Scottish Government Cabinet Secretary for Culture and External Affairs, Fiona Hyslop MSP, and the Chair of Voluntary Arts, Peter Stark. The four Epic Award winners each received special Epic Award 2014 trophies made for us by Maklab and GalGael. GalGael is a community-engaged organisation in Glasgow that offers vulnerable people the opportunity to learn practical skills in wood working and GalGael also made the baton for the Commonwealth Games Queen’s Baton Relay. I read out personal messages of congratulation to the Epic Award winners from the UK, Wales, Scotland, Northern Ireland and Republic of Ireland Culture Ministers. Details of all the winners and runners-up can be found at http://epicawards.co.uk. The evening finished with the presentation of the Peers’ Award for Excellence 2014, voted for by the shortlisted groups, which went to Foyle Haven Arts Collective in Derry for a creative writing project that gave the homeless and those struggling with addiction a voice in print and on stage as part of Derry/Londonderry UK City of Culture 2013. We were then piped out of Platform Arts by Scotland Epic Award runners-up, Lewis Pipe Band. Thanks to all Voluntary Arts staff, Board members, Advisory Group members and Voluntary Arts Ambassadors across the UK and Ireland for their help with the administration, shortlisting and judging of Epic Awards 2014. A particular thank you to Jemma Neville, Director of Voluntary Arts Scotland, who managed the Epic Awards scheme this year. Thanks also to everyone who sponsored Epic Awards and donated prizes – we really value your support. And thanks to Fiona Campbell for her calligraphy on the beautiful Epic Award certificates. The Epic Awards Winners’ Reception was part-funded by the Big Lottery Fund and Spirit of 2012 Trust ‘Keeping the Spirit of 2012 Alive’ programme. It was a moving and inspirational evening celebrating the extraordinary achievements of local volunteer-led arts groups. On Wednesday I was at Platform Arts in Easterhouse, Glasgow for the Voluntary Arts Scotland Conference ‘Culture, creativity and you: why making matters’. Delegates were brought to the conference from the centre of Glasgow by bus with local historian Douglas McCreadie explaining the history and culture of the area. The Acting Chair of Voluntary Arts Scotland, Jim Tough, opened the conference and Jackie Shearer, Arts Manager at Platform, described the role the arts centre has been playing in urban regeneration in Easterhouse. 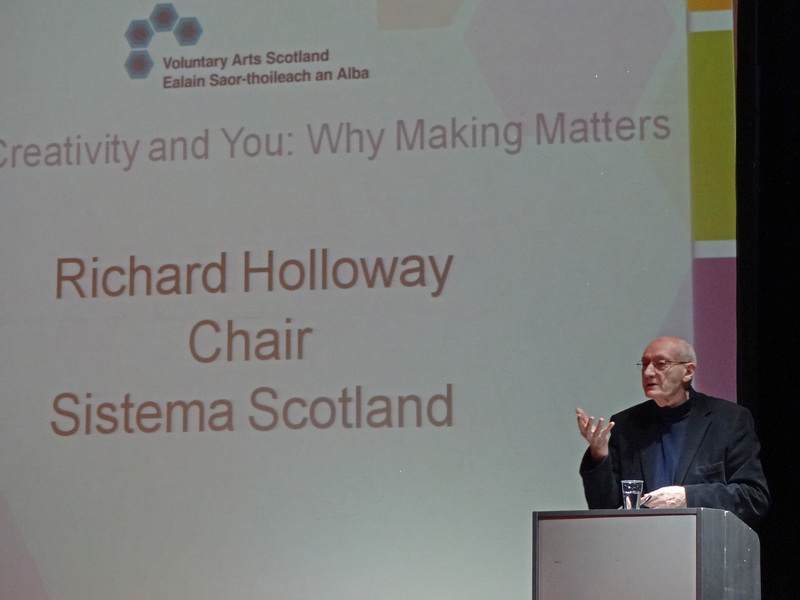 Richard Holloway speaking at the Voluntary Arts Scotland Conference ‘Culture, creativity and you: why making matters’. Our keynote speaker was Richard Holloway, Chair of Sistema Scotland. Richard, a former Chair of Scottish Arts Council, spoke passionately and inspirationally about the how humans “represent the world back to itself” through art. He said “play is the fundamental engine of human evolution” and suggested that culture requires both conservatives who preserve traditions and radicals who break new ground. He spoke about the challenges of the modern world, suggesting “we have created a leisured class [the unemployed] with no capacity for using that time wisely”. He said “we’ve created a class that works too hard and a class that can’t get work”. Richard Holloway spoke about the success of ‘The Big Noise’ in Raploch, Stirling, saying there are now 12 children from Raploch in the National Youth Orchestra of Scotland. 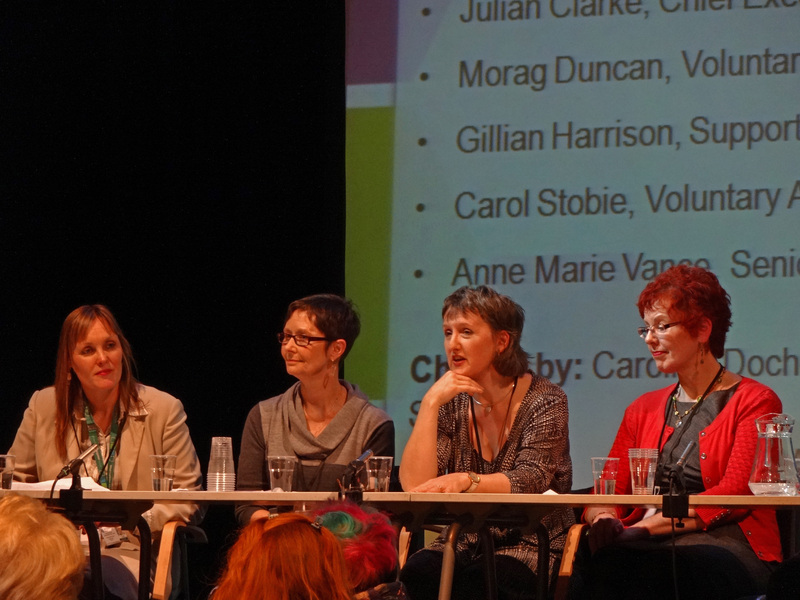 After lunch the conference continued with a panel discussion, chaired by Caroline Docherty from Creative Scotland reflecting on the Voluntary Arts Scotland Crafting the Arts project (funded by The Big Lottery Fund). Gillian Harrison and Carol Stobie spoke about our learning from the project, the changes to local authorities and Third Sector Interfaces over the past five years and the achievements of our Voluntary Arts Ambassadors. It was great to see so many Voluntary Arts Ambassadors in the room and to have a chance to pay tribute to the wonderful voluntary contribution they have made to the work of Voluntary Arts Scotland. 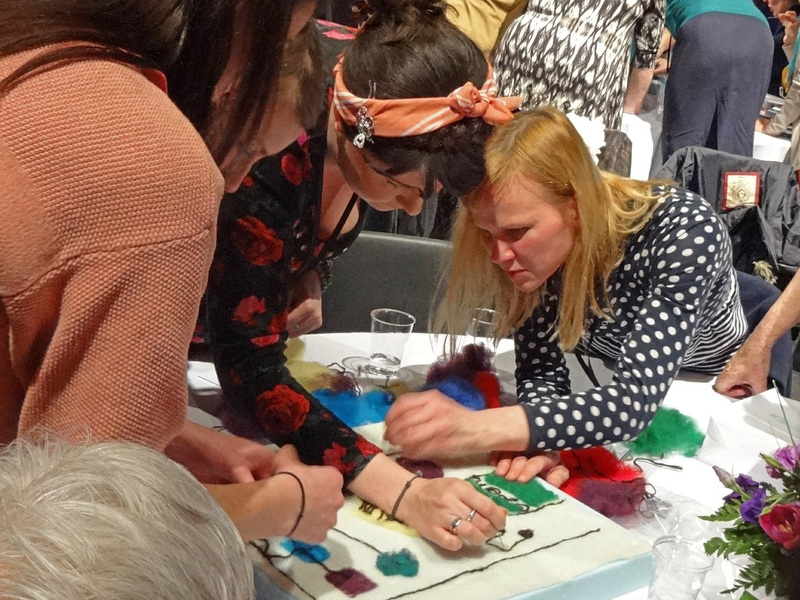 Delegates then engaged in a ‘Cultural Crofting’ creative discussion, addressing the challenges facing local cultural infrastructure and expressing possible solutions through the medium of felt-making – with expert instruction and support from members of the International Feltmakers Association. 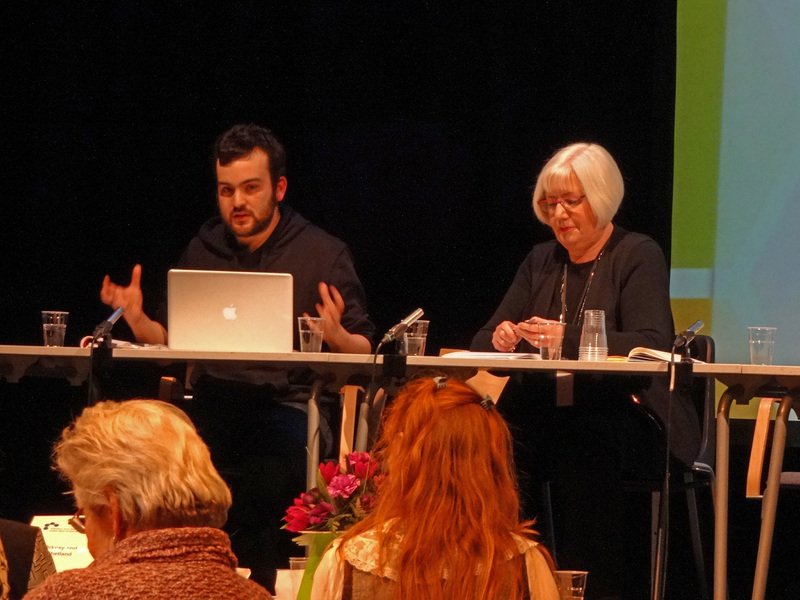 The final session of the conference saw us hosting what we believe to be the only public debate on the Scottish Independence Referendum to focus on the implications for the arts and culture. Christopher Silver of the National Collective represented Yes Scotland and the Labour Party’s Shadow Culture Minister, Patricia Ferguson MSP, spoke on behalf of the Better Together Campaign. They were joined by Andy Milne, Chief Executive of SURF, Scotland’s Independent Regeneration Network who provided a thoughtful provocation. The ensuing debate was thoughtful and polite with many areas of agreement between the speakers about the importance of the arts and culture in Scotland’s future and the need to encourage as many people as possible to vote in the referendum. The Voluntary Arts Scotland was an excellent event in a great venue with a creatively constructed programme, interesting speakers and an attentive sell-out audience. Congratulations to Jemma, Kelly, Gillian, Carol, Jason, Cassandra and Harriet for a wonderful event. On Tuesday I was in London to take part in a meeting of the Cultural Commissioning Programme Advisory Group. The Cultural Commissioning Programme is a three year programme, funded by Arts Council England, to explore how arts organisations can better engage with commissioning in order to develop better public service outcomes, diversifying income and users for arts organisations and ensuring high quality arts work in a public service context. Since the first meeting of the Advisory Group in November, the programme partners (the National Council for Voluntary Organisations, New Philanthropy Capital, the New Economics Foundation and Mission, Models, Money) have agreed three main areas of focus with Arts Council England: older people; mental health & wellbeing; and place-based commissioning. On Tuesday we looked at an overview of the programme workstreams and considered the detailed evaluation framework. I pointed out the importance of the potential role of intermediaries or brokers to ensure the involvement of small, local culture organisations in commissioning. We agreed the need to ensure that, as well as persuading more arts organisations to apply for commissioned work and urging commissioners to consider arts organisations, it will be important for the programme to focus on maximising the positive impacts on society of this activity. We were joined on Tuesday by Jane Tarr, Arts Council England Director of Resilience, who explained how the Cultural Commissioning Programme fits within ACE’s goals and priorities. I was back in London on Tuesday to take part in the National Alliance for Arts, Health and Wellbeing national organisations meeting. Damian Hebron from the London Arts & Health Forum reported on the first meeting of the new All Party Parliamentary Group on Arts and Health. He said it was a really positive, well attended meeting which agreed that the main topics for its next three meetings will be dementia, parity of esteem and the role of the arts in engaging ex service personnel. We also talked about how we could all use the Alliance’s Arts, Health and Wellbeing website (http://www.artshealthandwellbeing.org.uk/) as a repository of evidence and how we could work together to promote Creativity and Wellbeing Week in June, see: http://www.creativityandwellbeing.org.uk/. On Monday I was in London to meet Geraldine Collinge, Director of Events and Exhibitions at the Royal Shakespeare Company. 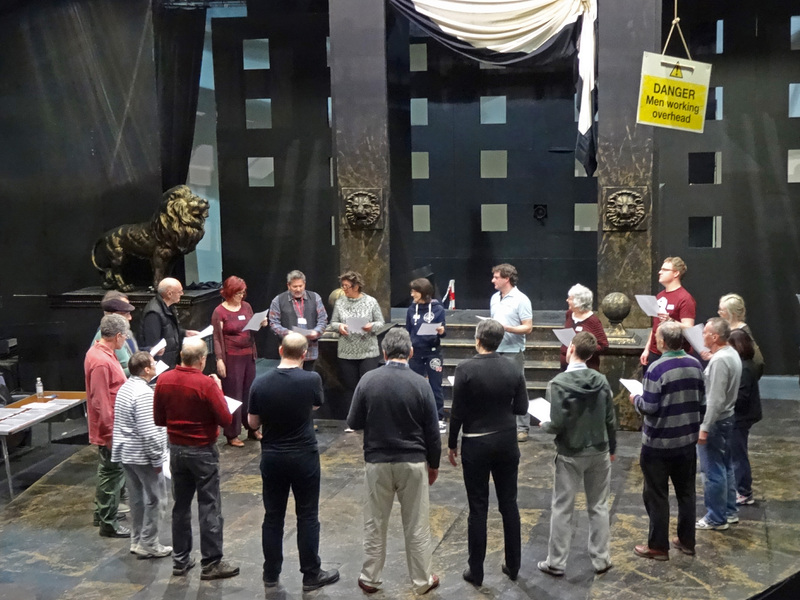 We talked about the progress of our second Open Stages project which is currently involving 100 amateur theatre companies across the UK. We also discussed the possibility of further collaboration beyond the end of the current project and revisited some of the ideas we had originally considered that didn’t make into Open Stages.